On the Wednesday 5th February 2014 I will be giving a talk at the Cudworth Community Fire Station on Tumbling Lane (near the new roundabout between Lundwood and Cudworth) on some of Cudworth's First World War soldiers. Some years ago now two of the members of the Cudworth Local History and Heritage Group (CLHHG), John Hayhoe and Alex Clarke, with help from many other members of the Group, produced a book, Lest Cudworth Forgets, which investigates the stories of all the men named on Cudworth's war memorial from both World Wars, the prisoners of war and the medal winners. Since that book was published in 2005 it has become even easier to research First World War soldiers online; Service and Pension records, medal cards and Silver War Badge records are available from Ancestry, and of course the 1911 census has been released allowing us a window into the families of the men who, just three or four years later went off to war. Just yesterday we heard news that the Imperial War Museum was launching a project to make thousands of diaries from the First World War more widely available online. 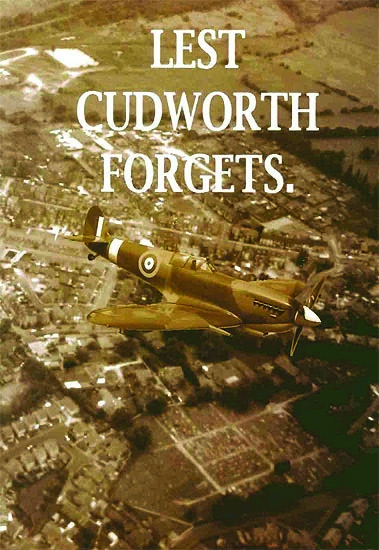 I will be speaking about three or four soldiers from Cudworth in my talk, I'm hedging my bets at the moment because it does depend on whether the men have a good story. It wouldn't make a very interesting talk if none of their records survive and if I can find nothing about them in the census or parish records or local newspapers! Walter Parkes was suggested to me by John and Alex as his First World War story is fairly unusual. I have spent a couple of days investigating him and I do agree, however his life before and after the war has been much harder to pin down. The first proper mention I can find of Walter Parkes is in 1913 when he marries Eva Harper at St John's church in Cudworth. If you look at the marriage certificate above you will see that he does not mention his father. This may be because he was dead, sometimes people thought this section of the record was only relevant if the father was still living, it may be because he doesn't know who his father was ... however I tend towards the first explanation as I have found that illegitimate brides and grooms usually invent a father to cover up the lack! We can see that Walter is a miner and 23 years old, that make him born around 1890, Eva is 21, therefore born in 1892 and her father is John Harper, an Engineman. Both bride and groom live in Cudworth. The next thing I usually do is track backwards to the last relevant census to find the couple before they married. Eva was easy to find, she was living with her parents John and Annie Harper, three brothers and a sister at 176 Barnsley Road, Cudworth on 2 April 1911. Walter was much harder. I think he may be a boarder in Carlton Terrace which was near Royston and adjacent to the Carlton Main colliery. He does give his occupation as Coal Miner and his age fits. There's a map showing this terrace on one of my previous blog posts about Cudworth. Unfortunately on the census this Walter Parkes birthplace is transcribed as "at Wales" which isn't very helpful. Wales the country, or Wales near Sheffield? Or just a mistake by the family he was lodging with? What does that last word on Walter's line actually say? Click on the picture to open it up in a larger window - Wails? Walb? Walli? Backtracking further still I found that there were only two Walter Parkes born at around the right time, one in Sandbach, Cheshire and one in Newport, Monmouthshire, which is in Wales. Unfortunately the Welsh Walter is listed quite clearly in the 1911 census living in London as a London County Council clerk, so he cannot be not our man. 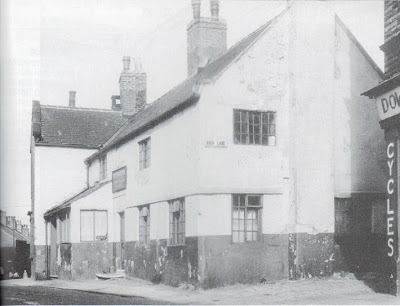 Looking at the Sandbach family, Edward and Ada Parkes have six children living at home in 1901 including an eleven year old Walter, but only three in 1911, although the additional information states that all six of their children are still alive. On Find My Past I found some enlistment papers for the Walter Parkes from Sandbach. He enlists on 28 November 1911 and states that he is 21 years and 6 months old and a Farm Labourer. Oh, dear, that kind of rules out the Sandbach Walter Parkes from being our 22 year old Coal Mining boarder in Carlton in April 1911. The fact that this Walter is discharged from the army the same day, probably for having unsatisfactory references, does however leave an element of doubt in my mind. And where was the Sandbach Walter in the 1911 census if he wasn't at home with his parents? 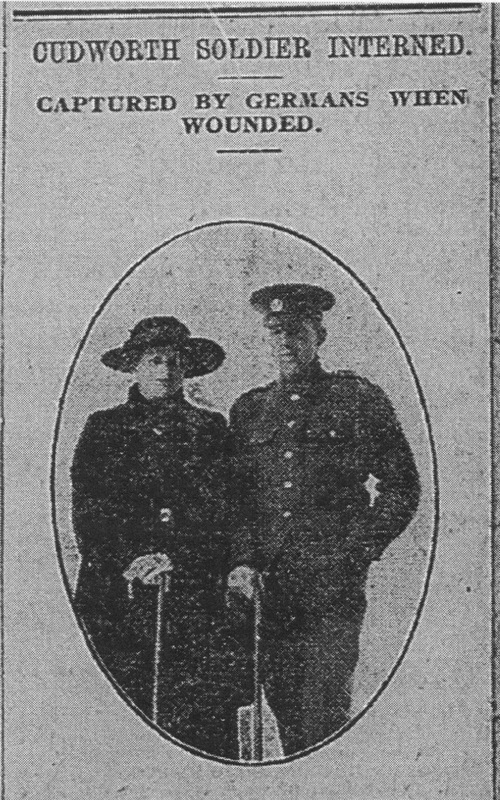 Meanwhile in Cudworth Walter and Eva's first child, Doris, is baptised at St John's on 6 December 1914 and Walter's occupation is given as Miner and Territorial Y&L. They or at least Eva is living with her parents at 136 Barnsley Road. When war was declared on 4 August 1914, men who were enrolled in the Territorial Force were called to arms straight away having in many cases been part time soldiers for years. From the limited amount of army records I have been able to find for the Cudworth Walter Parkes he declares his enlistment in the Territorial Force to have been on 22 January 1912. Could this be the disappointed Sandbach Walter applying to join the Territorials when the regular army wouldn't have him? Or am I clutching at straws? Walter is embodied on 5 August 1914 and he is immediately posted as a Lance Corporal in the 5th York and Lancaster Regiment. He is sent to France on 13 April 1915 and had made full Corporal in the 1/5th Y&L by November 1915, when his regimental number is noted as 1432. On joining the Territorial Force in 1912 Walter had only signed on for four years, however his records show that in 1916 he was retained in service under the 1916 Military Service Act. He had been promoted to Company Sergeant Major in the April of 1916 and retained that rank thereafter, though some confusion later did lead to him having to write to the regimental authorities to point out that he was a CSM not a Lance Corporal as it states on his medal records. Walter was awarded the Distinguished Conduct Medal on 6 July 1916, "For conspicuous gallantry during an enemy counter-attack. 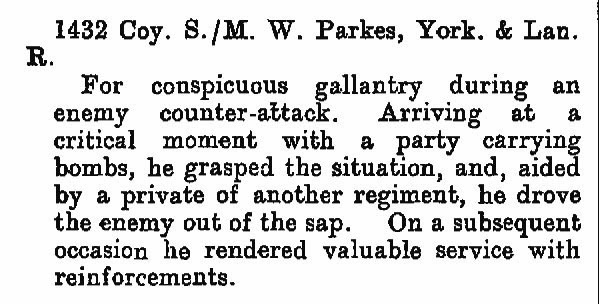 Arriving at a critical moment with a party carrying bombs, he grasped the situation, and aided by a private from another regiment, he drove the enemy out of the sap." He was 26 years old. Unfortunately on 7 July he is reported missing and two days later it is confirmed that he is a prisoner of war. 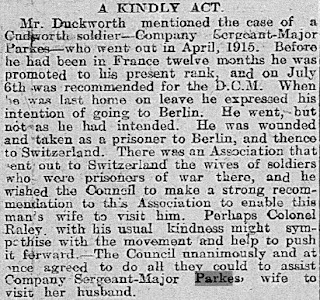 Reports filter back to Barnsley slowly during the war, but it doesn't take too long before his family in Cudworth are made aware that he has been interned in Switzerland as being unfit for further war service. 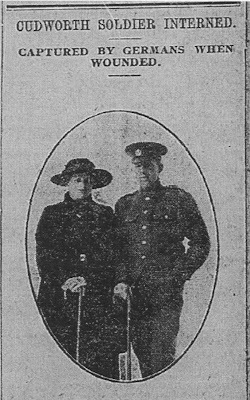 The comment on the left in the Barnsley Chronicle in January 1917 from the Council minutes shows that he was well respected and that people were willing to go out of their way to enable his wife to go to see him. This was quite an unusual occurrence and warranted a very long report in the Chronicle on her return in May. Walter had been wounded in the left shoulder and left eye. The newspaper report leaves us no doubt that he had been severely wounded "a bullet penetrated his left eye and destroyed the sight, damaged his cheekbone and splintered his shoulder blade". Despite this I see from his discharge papers that the pension authorities considered him only 50% disabled and that the disability was not permanent. 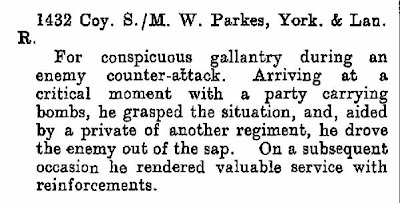 In November 1917 he was transferred to the 4th Reserve Battalion of the York and Lancaster Regiment and his regimental number changes to 240082. This caused me some confusion in my early research as for a while I thought I had two different Walter Parkes, no it's just the one man with two different numbers. The newspaper report also gives us a bit of helpful background on Walter, "formerly [he] was employed at Grimethorpe Colliery, and at the outbreak of war was at camp in Whitby with the Territorials". Another document in his discharge records dated December 1917 confirms his occupation prior to the war, he had worked at the Monckton Main Colliery at Royston for five years (which does place him in the vicinity of Carlton to be the man I found in 1911) and Grimethorpe for two years. As part of the procedure of his discharge he is asked what work he would like on returning home, Walter notes that he would like to remain at Grimethorpe as a Timekeeper, a suitable job for a disabled man. He is discharged on 22 January 1918 under King's Regulations paragraph 392 (xvi) which is "no longer physically fit for war service". 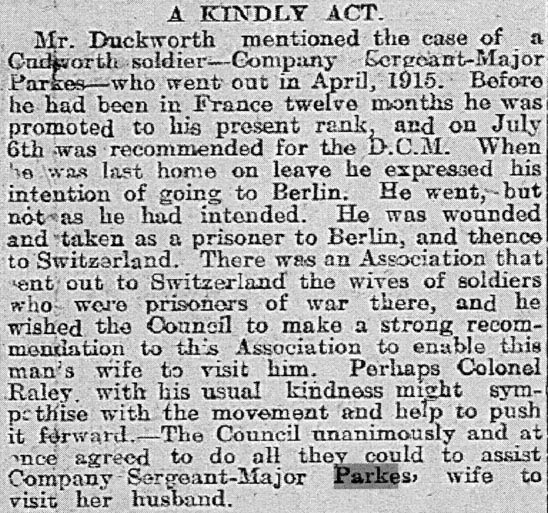 He must have returned to England between the visit of his wife in April 1917 and completing the documents for his discharge in December, but I can't see exactly when he got back. When Walter acknowledges receipt of his discharge papers on 5 January 1918 his address is 136 Barnsley Road, Cudworth, so they sent him home fairly quickly. He was awarded a pension of 37/6 (thirty-seven shillings and sixpence) for 4 weeks and 18/9 after that to be reviewed in 48 weeks. His disability was still recognised as being 50%. This really wasn't a lot of money for a married man with a child - his wife's separation allowance while he was on service had been 17/6 plus 2/6 contribution from his pay (there's more discussion on this here) - as a Coal Miner Walter had probably brought home more than £2 a week - he needed another job and quickly. When Walter and Eva's daughter Betty was baptised in November 1921 at St John's Cudworth Walter gives his occupation as Engine Man. So he's probably back at the pit, but not in his preferred job as Timekeeper. An engineman would have maintained and cleaned the engines for the winding wheels and pumps at the colliery, it was not a highly regarded job, although an engine man might be trained as a reserve winding man which was a very responsible post. The couple and their two children are still living with Eva's parents at 136 Barnsley Road. It must have been a bit crowded! And that is it - after that I lose Walter altogether. I cannot find a death or burial for him or Eva or any of the children, or marriages (convincingly at least) of Doris, Betty and Walter. Where do they go? What does a one-eyed disabled ex-soldier do in the 1920s? There's a depression coming ... maybe he emigrates? I just don't know. Walter has been a conundrum to me twice in his life - where did he come from and where did he go? He was a hardworking coal miner and part time soldier, a hero in the war, yet discharged on a pitiful pension, but he didn't let it beat him. He went back to the pit and then moved on to run a town centre pub for three years. In 1925 he is still only 35 years old - what did he decide to do next to improve the lives of his family? Eva's parents John and Annie Harper are buried in Cudworth cemetery having died in 1951 and 1946 respectively. 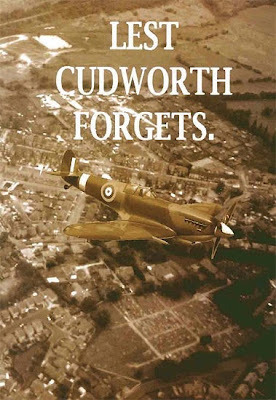 I wonder if any of the descendants of her brothers and sister still live in Cudworth? They might know where Walter and Eva and their children went after 1925. If anyone knows please get in touch, I hate leaving my stories unfinished! A contact has sent me information that suggests Walter and Eva moved to Dover. A couple with the right names ran the Granville Hotel there in the late 1930s. A Walter Parkes the correct age (ie born 1890) dies in Dover in 1940 and his probate entry on Ancestry mentions his wife Eva and the Granville Hotel.